Catriona will be performing with The Actor’s Project NYC on Tuesday, February 5th at 6:50pm Off Broadway at the Triad Theater on 158 W 72nd St, New York, NY 10023. Industry guests get free tickets! 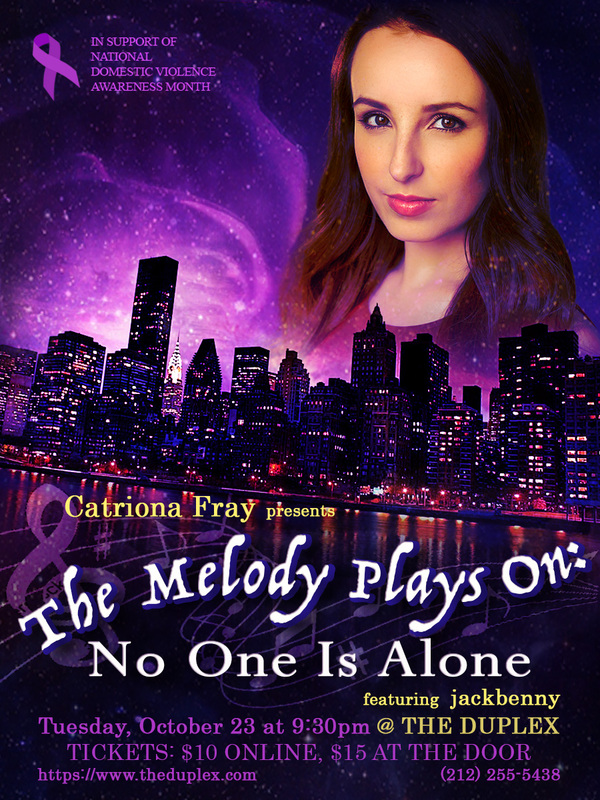 Catriona Fray sings with musician/songwriter duo "jackbenny" to inspire and empower survivors of assault/abuse for National Domestic Violence Awareness Month. All proceeds and donations will a local domestic abuse awareness non-profit organization. She is passionate about using her gifts of singing/acting/songwriting to help lift others. She has played numerous musical theater leading women who had to perservere through violent/abusive situations and relationships, and because of this, she has been inspired to tell their stories for this cabaret. CATRIONA FRAY is a graduate of UCLA’s School of Theater, Film, and Television, where she worked with Lainie Kazan as a performer in her cabaret series for 3 consecutive years. She also was a featured soprano in the UCLA ScatterTones a cappella group, traveling around the country singing with Pentatonix, Jojo in a national commercial for ABC Family, and at the Hollywood Bowl and the White House, to name a few. Since, Catriona has worked on two Kathleen Marshall directed/choreographed productions Mamma Mia at the Hollywood Bowl and most recently Sweet Charity as Rosie. Her favorite leading roles include the Witch in Into the Woods, Audrey in Little Shop of Horrors, and Lucy in Jekyll and Hyde. In Los Angeles, she also performed as Dale Bozzio in her Missing Persons tribute band, Noticeable Ones. Having just moved to New York, she is excited to see where this journey takes her! Catch her next at Feinstein's/54 Below for "Ladie's of the 80's" night on October 26th. Follow her on instagram @catrionalovesyou to see what's next! Catriona Fray just closed "The Scarlet Pimpernel" at the Chromolume Theater in West Los Angeles where she had the opportunity of playing Marguerite, the French actress who is caught between a complicated marriage, an ex lover blackmailing her, and saving her brother. She sang notable songs by Frank Wildhorn such as "When I Look at You" and "Storybook." Mamma Mia at the HOLLYWOOD BOWL!